Industry statistics reveal that a fair percentage of control loops are controlled manually, and are not automated. This fact was brought home last week, when a caller told us he needed “something to adjust the valve position so that the valve stays where it’s been set. And it’s real important that it can’t accidentally go off its own”. What he was describing is what we call a manual station. It’s a controller where the 4-20mA current output stays fixed where it is until someone pushes buttons on on the front of the controller: up to manually raise the output value, and down to manually lower it. Typically, the output value is displayed for the operator as a digital number from 0 to 100 percent. So what’s available to fill the bill? I pulled a Honeywell UDC 2500 (a model # UDC 2500 C0-0A00-200-0000E0-00) off the shelf to see if I could lock it into manual mode so it could not be switched into auto mode where it would “go off on its own” and attempt to control without even an input. Success on the first shot! A couple minutes messing with its configuration showed that it can indeed be locked in manual mode, as needed. When powered up, the controller starts up at a configurable output value. It displays the output value as 0.0 to 100.0% in its digital display, with the letter M, to show it’s in manual mode. The lower display shows OT for “output”. The up arrow raises the output and down arrow lowers the output. Pressing the M-A (auto/manual) key just shows Key ERR because the M-A key has been disabled in the configuration to prevent the controller from being put into automatic mode. A few configuration settings are critical. The power up setting (PWR UP) must be “MAN for manual mode. AUTOMA = DIS which disables automatic mode. Input 1 type must be 4-20 (not the default) and must be linear (LIN), not the default setting. The failsafe setting (FAILSF) in the control group is the value at which the controller powers up. In the Display group, the default TUNITs (temperature units) is F (deg F) which lights up the letter F in the display, but the letter F can be turned off by setting TUNIT to NONE. I suggest wiring the 4-20mA output in series with the controller’s Analog Input #1, then continue the loop wiring in series to the field device. Connect terminal 19 [output (+)] to terminal 26 [Input (+)], terminal 27 [input (-)] to the field device’s (+), field device (-) to terminal 21 [output (-)]. Wire the 250 ohm resistor across the terminal 26 (+) and terminal 27 (-). CAL (if you see this, I recommend going back to TUNING group and changing the LOCK setting to CAL (it’s now NONE), otherwise someone will get into calibration and screw things up. 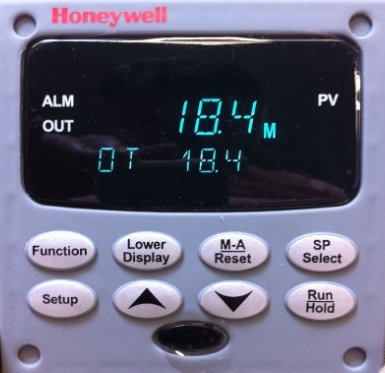 The Honeywell UDC nicely fills the bill where there’s the need for a manual station is needed. This entry was posted on August 3, 2012, 2:07 pm and is filed under Control, Loop Controllers. You can follow any responses to this entry through RSS 2.0. You can leave a response, or trackback from your own site.